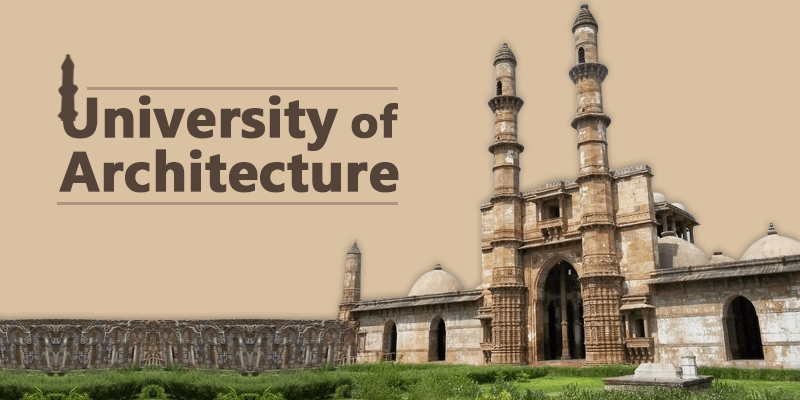 Located in Panchmahal district of Gujarat, the lost town of Champaner-Pavagadh is today known as the “University of Architecture”. 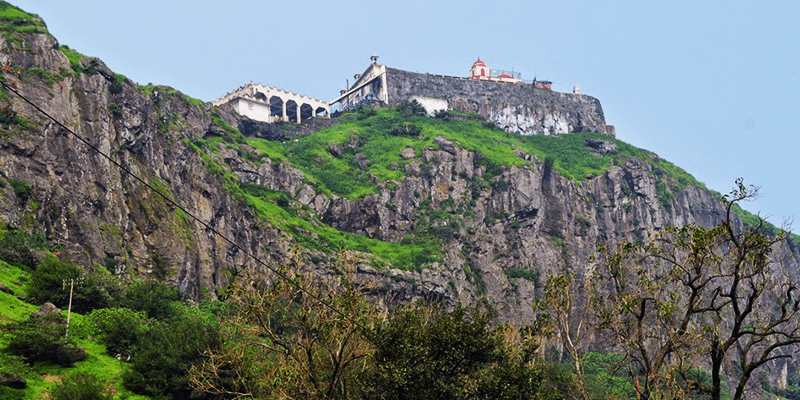 In the 16th century, the city of Pavagadh was built as the regional headquarters by Mehmud Begda. 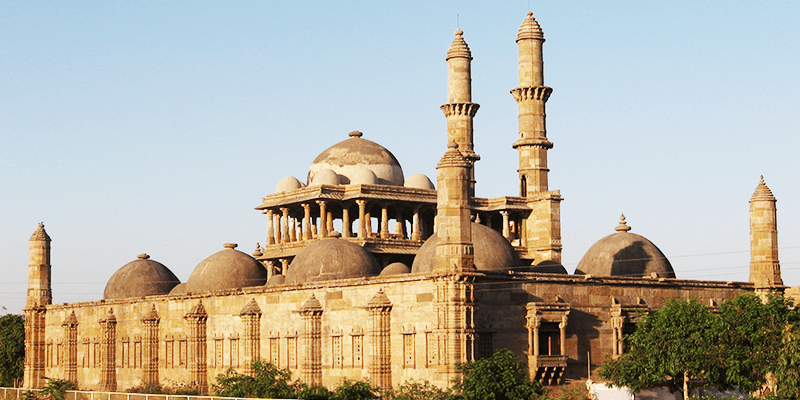 While the neighbouring city of Champaner was founded by King Vanaraja of the Chavda dynasty. The king decided to name the city after one of his valiant generals “Champa”. Both these cities have seen the ebb and flow of times, but they have remained unchanged. They are the only Indian sites carrying the unchanged remnants of Islamic pre-Mughal architecture. 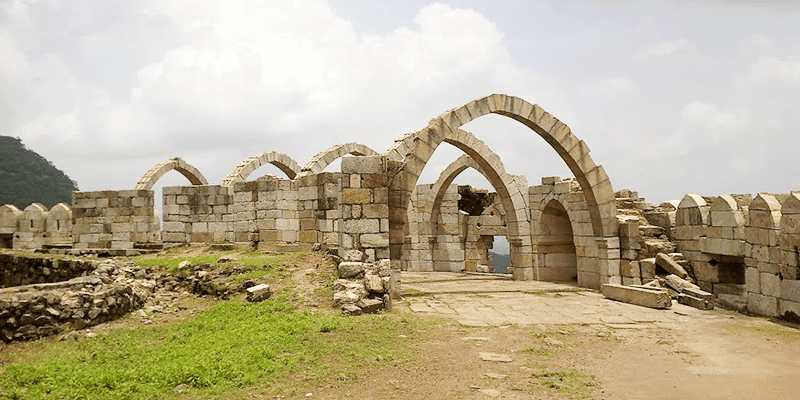 In 2004, Champaner-Pavagadh was designated as one of the UNESCO World heritage sites. Note: Though Champaner is the closest railway station, yet the train options are very limited here. So the ideal way would be to get down at Vadodara (55 KM away). Onward Journey: One can journey from Vadodara to Champaner-Pavagadh in buses. The Kalikamata Temple on top of Pavagadh Hill is considered to be an important shrine attracting lakhs of pilgrims throughout the year. It is believed that the right toe of Goddess Mahakali fell at the exact site of the temple, and the temple was erected by sage Viswamitra. The residing idol of the temple is Dakshina Kali, and the Mahakali temple is considered one of the 51 Shakti Peeths in India. A river flows beside the temple, and it is named after sage Vishwamitra. The trek up the flight of stairs to reach the temple is very adventurous and beautiful. Things to buy before the temple visit: Purchase cut fruits, beads and red vermilion from the small shops in the foothills. About the Trek: It would take about four and half hours to reach the temple from foothills. You need to climb a flight of 2500 steps. Prohibitions: You cannot carry tobacco products, leather goods, mobile and footwear inside the temple premise. While trekking, smoking is not allowed. Alternate for Trekking: If you would not like to climb up all those stairs then there is a ropeway that would take you uphill. The ropeway in these parts is known as Udan Khatola. After your tryst with divinity, it is time to see some of the marvellous specimens of pre-Mughal Islamic architecture. Jami or Jama Masjid: It is one of the finest architectural edifices of Gujarat with its latticed windows, carved gate arches, two 30-metre tall minarets, 7 mihrabs and 172 pillars. Carvings on the ceilings, pillars and the majestic domes will leave you in awe of the architects from the pre-Mughal Islamic era. The mosque is built with stones of many colours (such as pink, grey, yellow, red, etc.). Beautiful poetical verses are sculpted on the windows and doorways of the mosque. 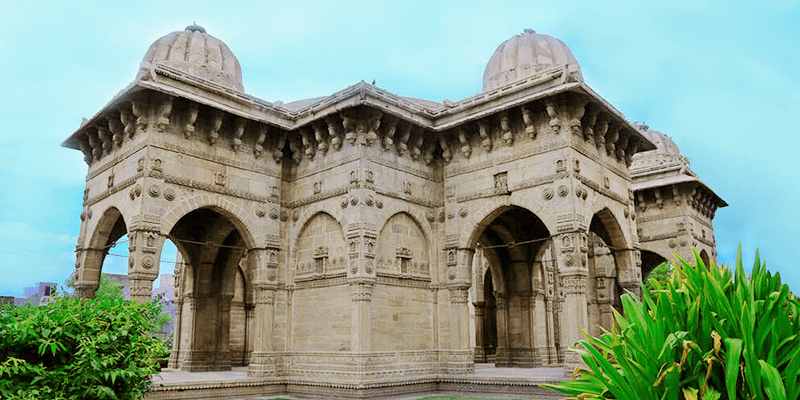 Kevda Masjid: It is known for its floral motifs and carved stones that adorn the dome shaped structures. Nagina Masjid: The name itself means the ‘Jewel Mosque’ and it is decorated with elaborate columns and windows that are carved with geometrical designs. Sikander Shah’s Tomb: Situated in Halol, this is a beautiful stone structure remarkable for its aesthetics and craftsmanship. Sikander Shah along with is his two brothers – Latifkhan and Nasirkhan were buried here. Nearby mosques worth visiting: Ek-minar, Sahar ki Masjid, Lila Gumbaj, Bawaman Mosque, Panch-Mahuda ki Masjid. Note: Out of these, Sahar ki Masjid is really beautiful and should not be missed. Vada Talao: It is a lake with a pavilion called Kabutar Khana. 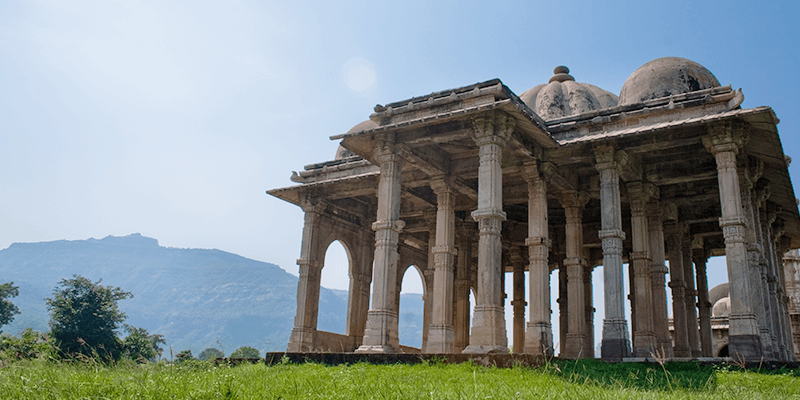 One of the best places to cool off in the shade if you visit Champaner-Pavagadh during the summer months. 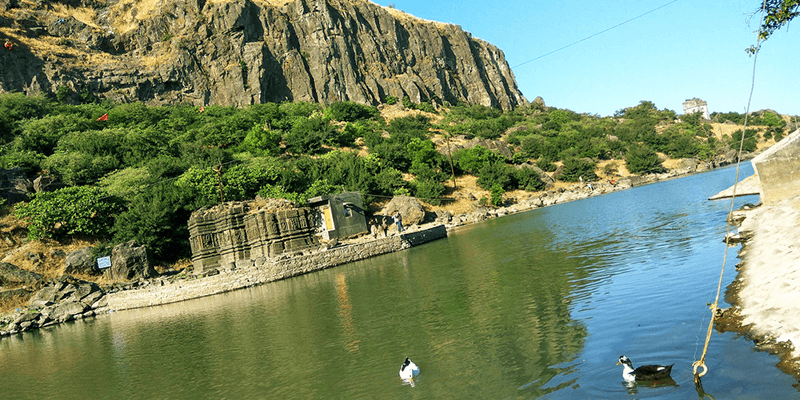 Teliya Talab and Dudhia Talab: Pavagadh hill is decorated with these two picturesque lakes. The beauty of these lakes can be experienced from the hilltop. These two lakes are situated on either side of the Mahakali temple. Khuniya Mahadev Waterfall: This ancient temple is situated amidst beautiful surroundings. 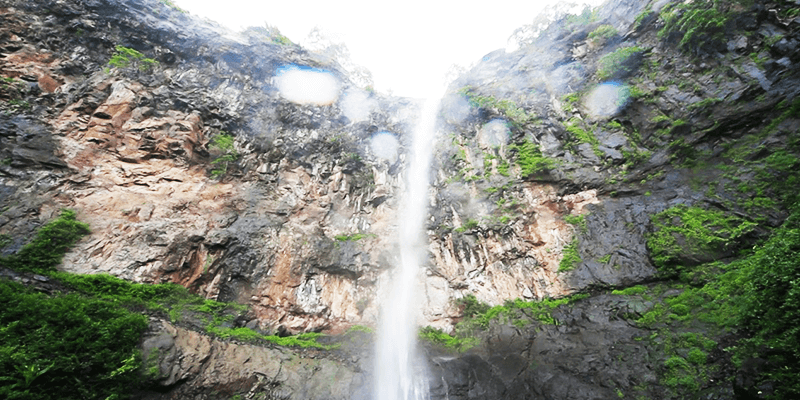 Situated inside the jungles, this waterfall has become an important tourist attraction of Pavagadh. The waterfall permeates into a clear stream whose water flows amidst the giant rocks cutting through the middle of the forest area. Built in the 16th century, this step well was built to supply drinking water to the travellers as well as the citizens. Though, the water from this well is no longer used for drinking it has become an amusing tourist attraction. 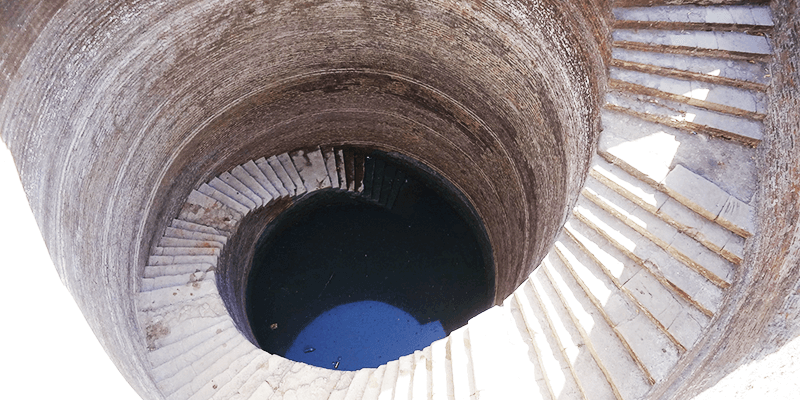 The circular construction of this 1.2 M deep step well along with its circular running stairs have intrigued the tourists. The low water level within the well, means tourists are also allowed to also venture inside the well with prior permission. As you walk down the well, you realise the magnitude of the well; its depth, breadth and width. 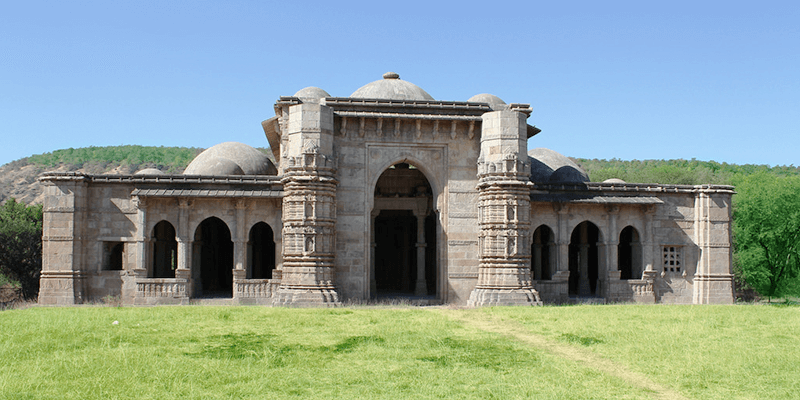 A trip to Champaner-Pavagadh opens up plenty of scopes to go history hunting. And the best place to view the ancient history of this province is in the elaborate fort and the buildings housed within its premises. 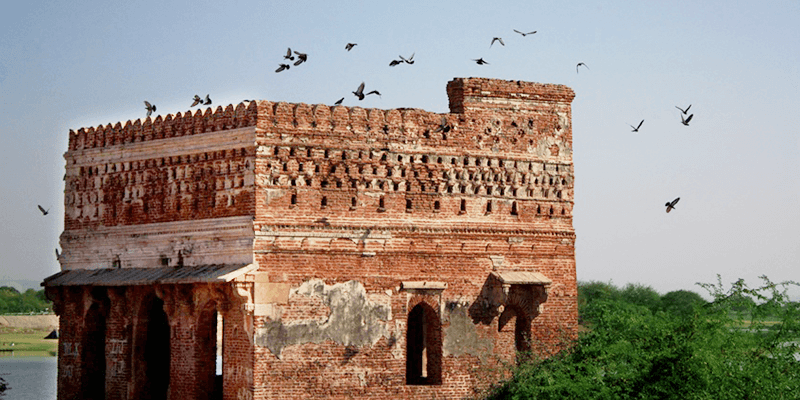 Pavgadh Fort: This fort is known to have been built before the Islamic rule by the Khichi Chauhans. In 1484, Sultan Mahmud Begadah captured the fort and included some Islamic elements to the fortifications. Spanning across the hills and Mauliya plateau, the fort is worth spending some time in. The walls are built with sandstone and has bastions at regular intervals. There are beautiful balconies as well. The elaborate gates such as Atak gate, Budhiya gate, Machi gate and Sadan Shah Gate have today become tourist attractions. 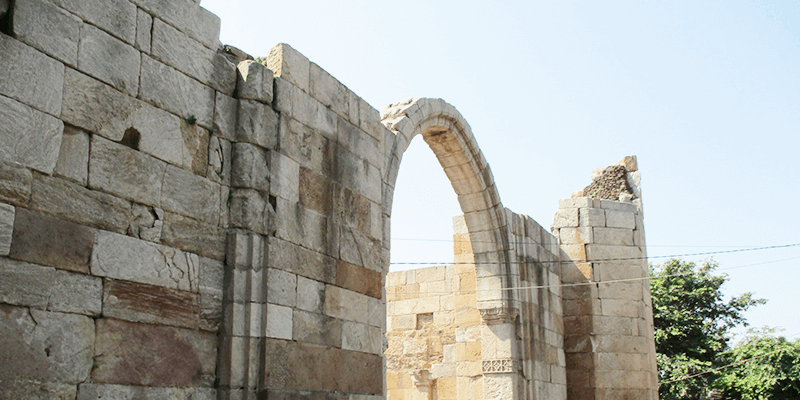 Sat Kaman: It literally means “seven arches”, though only six arches are existing now. Situated on the end of the Sadan Shah Gate (right next to Budhiya Darwaja). It was built for a strategic defence need. The guards could view the entire plains below from this spot. However, today it has become a prominent tourist attraction. The arches were built with yellow sandstone. One of the outstanding things about this structure is: the arches are kept intact by the interlocking mechanism, no cement was used to bind them! Timings: All these monuments are maintained by government authorities and close at 5 PM. The information about the places with a bit of History about it . This is awesome. One best way to make any travel freaks pack their bags and get ready.